As can be seen in the chart above, the earlier 12-month period showed results that seem to be roughly in line with the all-time distribution. 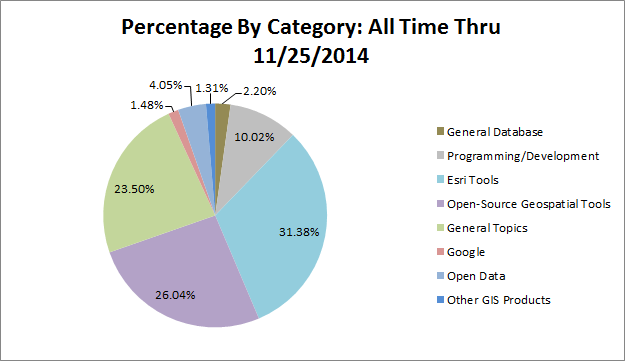 Esri-related discussions were roughly in line with all-time results. 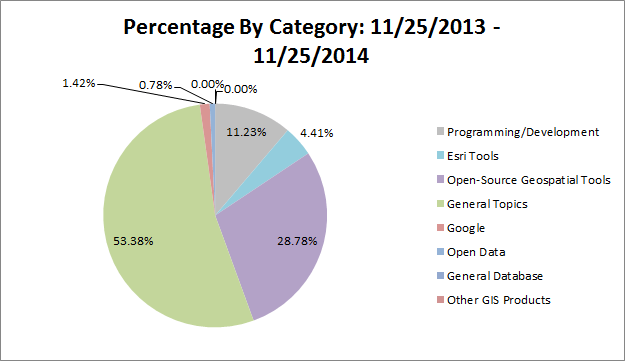 Open-source related discussions accounted for a much smaller, but still significant, segment of the result. General topics were by far the biggest kind of discussion during this period. The results for the most recent 12-month period, shown in the chart below, were much more surprising. 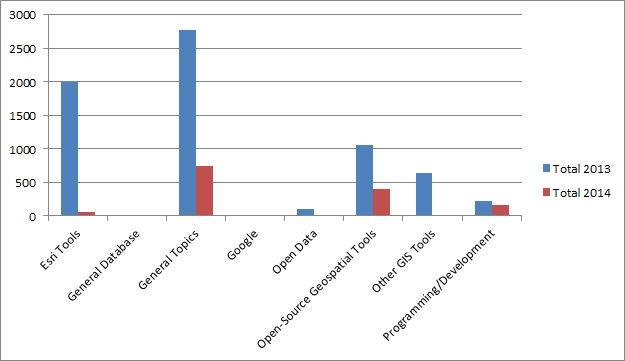 As can be seen, Esri-related discussions all but disappeared during this period, with open-source and general topics being the primary beneficiaries. In this case, the raw numbers tell the tale. During the first 12-month period, the top 100 tags accounted for 6810 posts. During the second, more recent period, they accounted for 1407 posts, a decrease of 5403 posts from one 12-month period to the next. The next chart shows this side-by-side. With such a significant drop in traffic, there were clear decreases in all categories, with the most significant decreases being in Esri-related discussions and general topics. 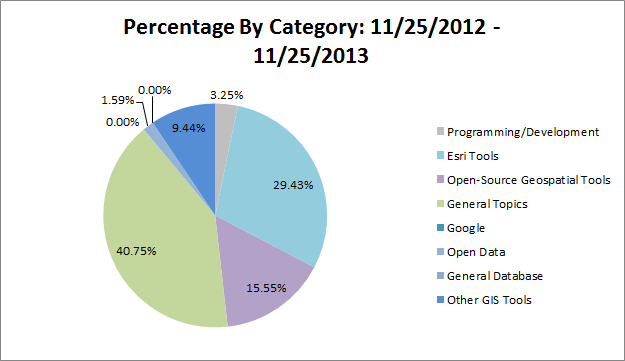 I typically hesitate to interpret this data to infer any conclusions about the GIS market, and I won’t do so this time. I do think this data says something about GISSE itself. There was one significant event this past year that I think could account for the drop-off shown above: the roll-out of Esri’s GeoNet. Esri-related discussions have dominated GISSE since its inception but they virtually disappeared during the 12-month period that included the GeoNet roll-out. I have a hard time thinking of that as a coincidence. I began investigating this theory by looking at the four months before and after the GeoNet “release” at this year’s Esri UC Plenary. The data I found was inconclusive. I seem to recall getting a GeoNet account some time before that so it is possible that early betas of the platform may have already been having an effect on GISSE. I think I will need to do a month-by-month analysis to see if I can identify when the decline started, but such an analysis will take more time than I have at the moment. The usual caveats apply: Posts can have multiple tags so the raw numbers certainly include multiple counting of posts. The “top 100” tags in any given time period will vary slightly, though usually at the lower end of the scale. Category assignments are based solely on my judgment but I have tried to be consistent each year. Tags can be edited by moderators and post authors, making them somewhat susceptible to potential manipulation.